Section 36: Emily Mahana Visits Section 36! Emily Mahana Visits Section 36! have noticed) another Yankees fan. Just like with Diana a couple weeks ago, as a way of "keeping your friends close, and your enemies closer" I thought it would be fun to have Emily visit with us to discuss those topics, the Red Sox, and a few more. I'm glad she agreed. I’m sure you will be too! So, let’s see what happens when Emily Mahana visits Section 36! Miss Upstate New York was your first pageant. What made you decide to compete for that title? Ever since I can remember, I’ve watched the Miss America pageant on TV every year. And every year after watching, I’d tell my mom how much I wanted to participate in something like that but I never had the time or confidence to sign up for one. Since it’s my last year of college, I’ve dubbed it my year of “why not” and have been going outside my comfort zone to try things that I’ve always wanted to do but never did. 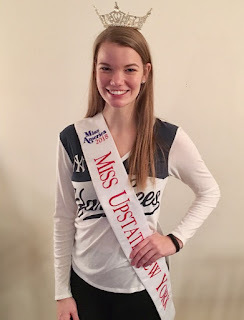 I reached out to Miss Finger Lakes 2017 and Miss Upstate NY 2017 before I signed up to compete for this pageant, and their advice and personal stories from being involved with the Miss America organization really encouraged me to compete in this pageant. How did you celebrate winning the Miss Upstate New York crown? Since it was my very first pageant ever, you can imagine how shocked I was when they announced my name as Miss Upstate New York 2018! There were definitely many happy tears. After crowning, my family, friends, and I celebrated in our hotel room, and then my brother went out to get me French fries from McDonald’s since I was so hungry and it was the only place open. Probably not the most glamorous story, but wouldn’t have wanted it any other way. What did you learn from the Miss Upstate New York competition that will help you when you compete for the Miss New York crown? I learned so many things competing in this pageant – about myself, the pageant system, and the Miss America Organization. The biggest takeaway for me moving forward is that confidence is key. Going into this pageant, I was so nervous and, at times, unsure if I had made the right decision signing up to compete. Even before crowning, I realized that as long as I was confident in myself that was really all that mattered. I hope that this new-found confidence will shine through on the Miss New York stage. Your talent is Irish dance. What do you like most about that activity? I’ve been Irish dancing for 14 years, so it has been a huge part of my life for a long time now. I compete throughout the northeast and across the country, and enjoy performing in my community during St. Patrick’s Day season. I’ve had the opportunity to meet so many people through my travels to compete and perform, which have led to creating friendships with people from around the world. What is your platform, and how did you select it? My platform is encouraging increased involvement of girls and young women in STEM fields. STEM fields are those areas relating to science, technology, engineering and math. I’m currently a senior at Syracuse University studying civil engineering, so I’ve experienced firsthand the inequalities that go along with being a woman in a STEM field. It is my hope to serve as a role model and show girls and young women the benefits of pursuing a career in these areas. You’ll be graduating from Syracuse University with a civil engineering degree, which is a broad field. Which area do you see yourself focusing in? As of right now, my plan is to attend graduate school to pursue a Master’s of Engineering degree in structural engineering. I hope to eventually work on the design on large scale bridges or buildings in the northeast area. I’ve been interning here in Syracuse, NY for some time now working on designing various bridge components, and I love the fact that I can make a lasting improvement for the community that I end up living in. As a Yankees fan, who is your favorite current Red Sox player? Well, as a Yankees fan, I have to say choosing a favorite Red Sox player is pretty much impossible. I think if I were to say I had a favorite, my family might disown me. With that being said, I’d have to say my favorite Red Sox player varies from game to game and inning to inning. Basically, which ever player makes the most errors and unintentionally helps the other team out, especially if it’s the Yankees, has to be my favorite. Sorry (not sorry) Sox fans! I’ll never forget sitting in my living room and watching Aaron Judge and Tyler Austin hit back to back home runs at their first game in the majors. That was hands-down one of the coolest moments to see. Watching how successful he continues to become just adds to the excitement us Yankees fans have for the upcoming season! Have the Yankees done enough this offseason to win the division over the Red Sox in 2018? To be honest, I think if I wasn’t already a Yankees fan I’d definitely consider becoming one given the recent addition to the roster. A lineup with Sanchez, Judge and Stanton could be absolutely lethal for other teams, especially the Red Sox. I know they have the potential to add some big names to the roster, too, but I still think the Yankees should be a team to watch out for once the season starts. Hard to really argue with that. I agree that the Yankees have certainly put themselves in good position to win another Wild Card! As usual, I want to give huge thanks to Emily for doing this interview. She did a wonderful job, especially with the Red Sox questions. I also want to thank her for taking a fantastic picture specifically to accompany the interview. I appreciate the extra effort to help the post look great! As Emily continues her time as Miss Upstate New York, I encourage you to follow her on the official "Miss Finger Lakes and Upstate NY" Facebook page. Also check out Emily's own Miss Upstate New York 2018 Facebook page and Instagram account. Also, be sure to visit the official websites for both Miss Upstate New York and Miss New York. If you do all that, you'll be sure not to miss a thing Emily does! I also want to wish Emily luck when she competes for the Miss New York Crown! As she joins Diana, it would be so much fun to have a Section 36 visitor bring home that crown! Thanks again Emily, and good luck!